The Dura-Ace CS7900 series has updated the cog design, which yields a more robust shifting and further weight savings than the preivious generation. The CS7900 is compatible with all 10- and 9-speed Shimano hubs. Computer designed Hyperglide cogs offer improved shifting. Perfect for your cross rig when you need the most precise shifting available. The bottom 4 cogs are Titanium to lighten things up a bit and are treated with a superior surface treatment to increase durability by 30 percent. The other cogs are nickel plated. 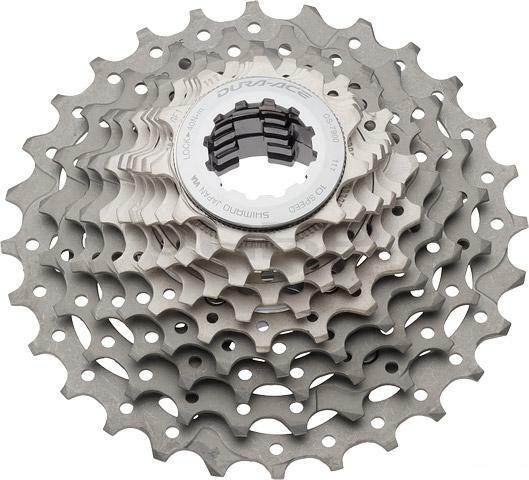 Compatible with all 8, 9 and 10-speed Shimano hubs.